I've been using this nifty little beauty tool for a few weeks now and have grown to like it a lot. Despite never being one for makeup sponges in the past, I find myself reaching for it on a regular basis over my favourite stippling/buffing brushes. It's very quick and easy to use, and I find it easy to achieve a natural but airbrushed effect in no time at all. The trick is to use the sponge damp and bounce and dab it over your face, for a flawless finish. 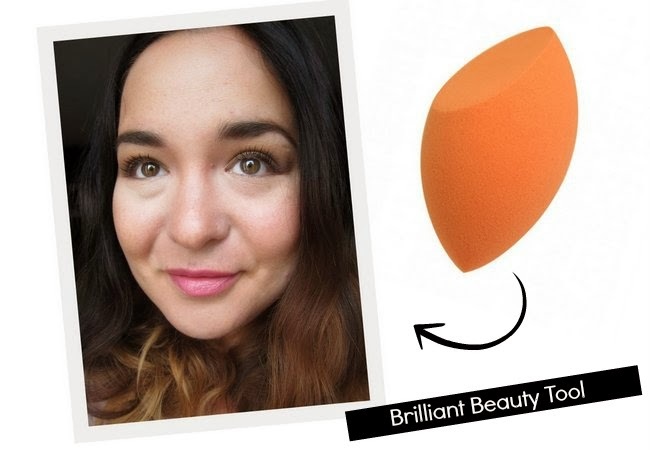 The main point of difference between this and other sponges, such as the Beauty Blender, is the shape: the flat edge is ideal for patting on product, while the rounded sides are great for blending. For around the nose and under the eyes, the pointed tip is ideal. Like all the Real Techniques products, this is brilliantly priced - you'll find it for just €5.99 on Cloud 10 Beauty, who sent me mine to try. Would you give it a go, or what method do you prefer to apply your base? what a lovely lil blog to read on an early monday morning! I should try this, I've been searching for a good sponge. Everyone has been ranting and raving about this! I never use sponges for my makeup (well, I haven't in a longggg time) and I'm almost afraid to try one haha. But for €5.99 I think I'll have to give this one a go! Love the sound of this sponge. I recently bought a new stippling brush & adore that, but at such a good price I may give this a go & see which gives the best effect. I stopped using sponges so long ago but this..is a whole different story. Great review! I have a few sponges and really should start using them again! So that's how you get a natural yet airbrushed look! I've been using this but not getting the absolute fuss... I haven't been dampening it though, must try it tomorrow! I don't think I've ever used a sponge to apply my make up! But that makes me even more curious to try it out! The finish looks great in the photo! Hope you're well Emma! It's terrible how you go away for a week and it takes two weeks to catch up!! sounds great. i haven't used a sponge in a really long time. I actually saw this on store shelves here this month and wondered how it would be, thanks for the review, sounds good! it's on my list to try! I'm curious about this because it gets such good reviews but I always hated sponges. I think for the price, it's worth a try.